I've always stayed away from illustrating other authors' works, mostly because I feel incompetent to the task -- especially when the author has already done his own illustrations. And yet, in 2001 I was asked by a dear friend to create illustrations for a children's theater adaptation of The Hobbit he was directing. I said yes, fool that I was. 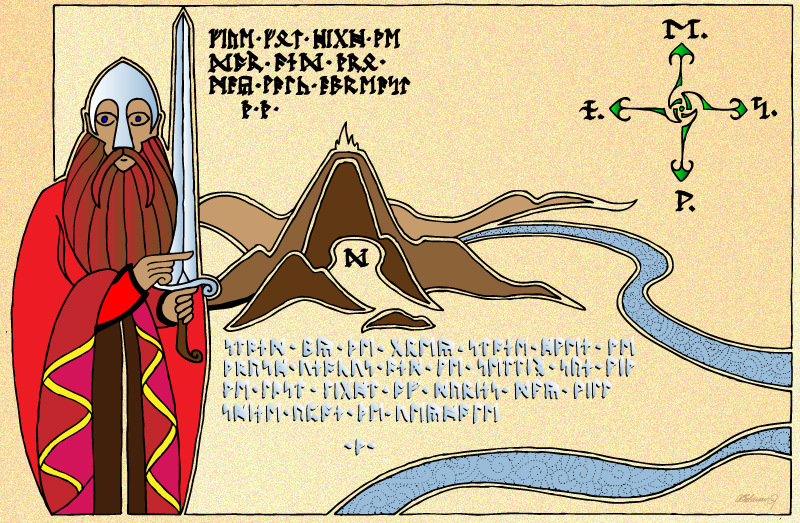 Thorin's map of the Lonely Mountain is one of the famous illustrations J.R.R. 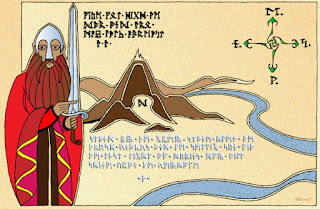 Tolkien did for his Lord of the Rings prequel masterpiece. My brief was to draw a version of it for use as a stage prop in the production. My first sketch featured an elf and I quickly self-corrected to use a dwarf instead. I kept as many of the key elements as I could, making difficult calls on what could be sacrificed for the sake of clarity when seen from the audience. Originally I created a mockup in Photoshop that placed my illustration on top of a parchment pattern. For the production, however, a piece of roughed up printer paper served as the prop. I'm reasonably certain that the audience (the play was quite well received, I understand) never noticed.